The search for a new home continues. I have found quite a few that would work, but some really need a ton of updating or they are in an area that is a little iffy. I think location is everything, so that is my main focus. I can't move a house but I can improve and update it. When you're looking at 20+ year old homes paint and floors are a given. Then you get to the heart of the home and kitchens usually need a lot of updates. Some would be fairly easy fixes and others would almost be a gut job. 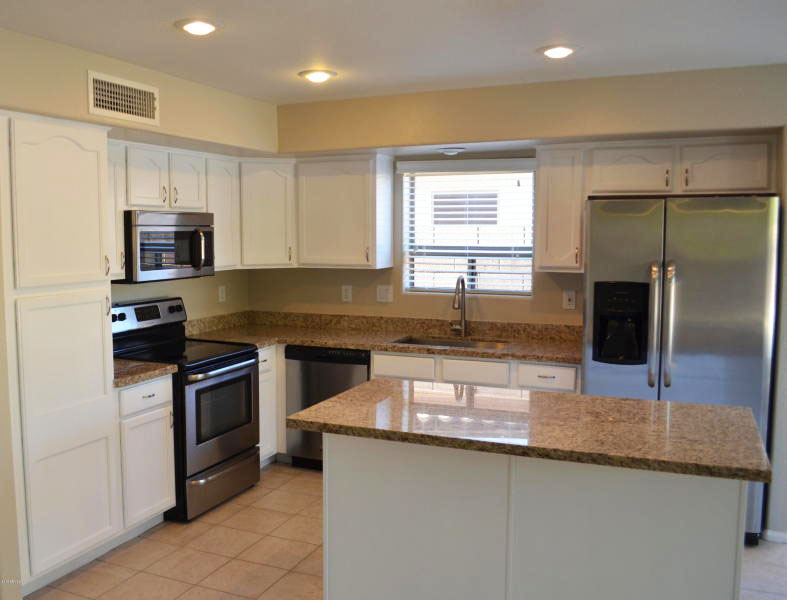 I have seen quite a few where they painted the oak cabinets and updated the appliances. The problem with this one is it is really small, there are hardly any cabinets and then the granite is pink. 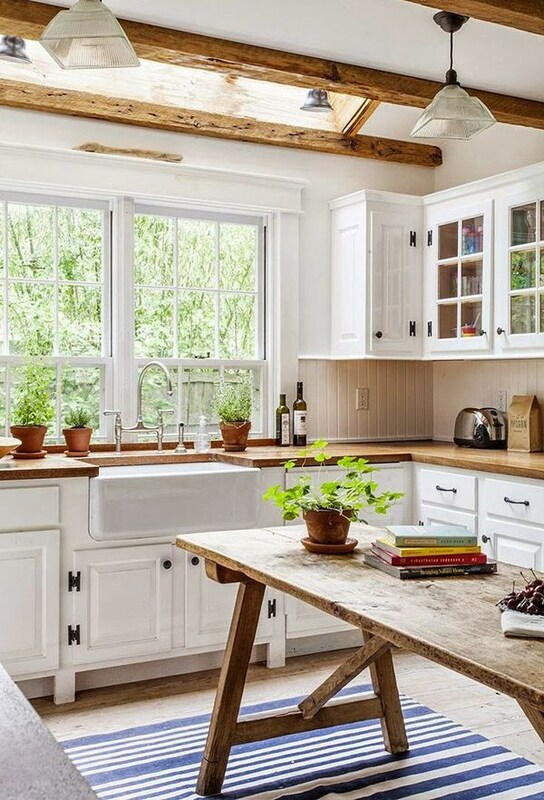 New counters, beadboard, farmhouse sink, hardware and light fixtures and this one could take on a farmhouse look like either of these two below. You could even use black textured formica counters or butcher block and both are economical. Then we have the so called "UPDATED KITCHEN". There are several problems with this that I see right off the bat. #1 Appliances. This kitchen needs a whole new appliance package. #2 Cabinets. These need to be either stained, painted or refaced. 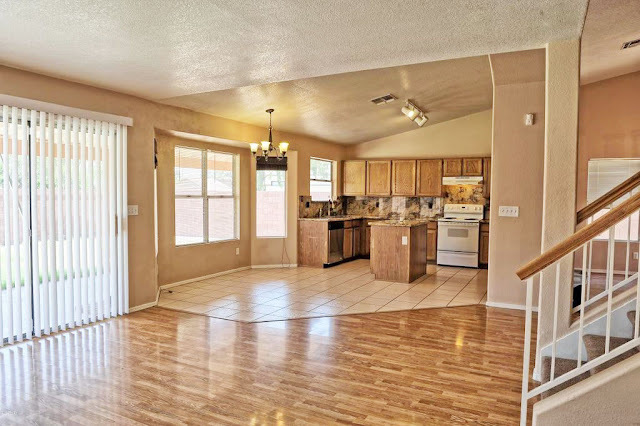 Painting would be all the budget would allow in the beginning, but what color would you paint these with those yellow/beige/brown granite counters and back splash. #3 Back splash. I think the back splash needs to go and then what? #4 Wall Color. Obviously this room needs painting, but since the counters and the floor are on the beige tones, could you really get away with white? The main problem with this kitchen is again money. Appliances and some cosmetic changes would be all the budget would allow to begin with and I am TOTALLY CLUELESS on what to do with something like this. I just look at it and go blank. Give me your input. I need to be able to see a vision so the next house I see with this same problem I can see past it. I like the first kitchen, Marty. If you changed the paint color would it make the granite seem less pink to you? The last kitchen has just too much granite! You could paint the cabinets and put in a different backsplash. Maybe you could sell the granite that you remove. - I'd keep the granite rather than changing to formica or butcher block, both are much less indestructible compared to granite, need more maintenance, and will reduce your home value and interest when you want to sell it later on. Oh Marty, big decisions to make. I liked the second one and sometimes you have to live in a place to see what you want to do. It would take time to make it as beautiful as the home you have now. You are very good at decoration and updating rooms. Take a friend and see what they have to say. I am sure you will make the right decision. Talk to the Chamber of Commerce and see what they have in store for the neighborhood that is iffy. I am leaning towards the first one. The layout actually reminds me of the blog, Dear Lillie. She updated her brother's kitchen and for some reason I thought of that kitchen when I saw the first one. Plus, you could start living in that kitchen right away without having to do anything at first. With the second kitchen, every time you walked in there you would keep thinking - "Oh no - where do I begin?!" Then again, the second one is bigger...I guess it all depends on how much work you want to do! Good luck - it will be fun to see where you end up! I think if you find the home and the right location the upgrades and changes will come along for you too. I know you have such a good eye for design for with a little imagination you could make either of these kitchen work. The first one does not have a lot of granite and with it being pink you could remove it and then put in butcher block which is very economical and wears well in a kitchen. The second one has way too much movement and too much granite. It could work with taking the back splash off. I know when you find that right house you will be able to change it to your liking. I like the second and third kitchens. They seem to have little to be done to update or make current. But its all about personal preference. I'm getting away from all white kitchens, its getting redundant. Granite is overrated also...if I had my choice I would have done wood or soapstone. But I have a husband! i think it has good bones and you can definitely put your touch on it to make it what you want. 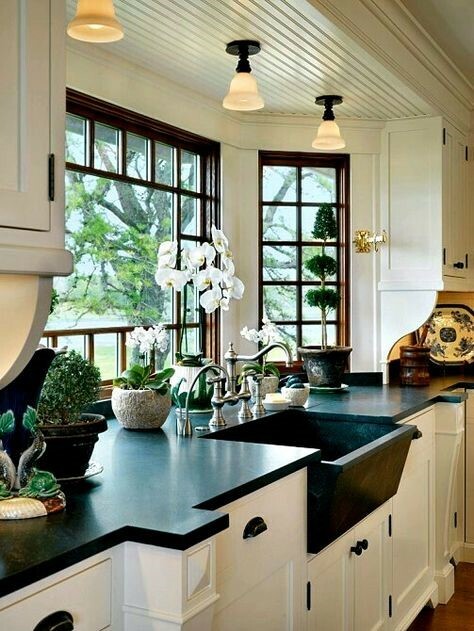 For the second kitchen, I would go with dark paint on the cabinets pulled from the granite. I would leave the backsplash-the room needs the pattern movement to offset the plain floors and walls--it also reflects light and gives shine. The vaulted ceilings are a plus. A stainless appliance package would help brighten the room, also, with hardware to match. Marty, I can see potential in both kitchens. You have done such a beautiful job with your present home, I know that you will do the same with your new home. In looking at Kitchen #2, I agreee that the grantite backsplash is too much. What about removing it and replacing it with bead board for the farmhouse look. My mother just redid her kitchen and painted her cabinets white, added oiled bronze hardware, and painted white bead board for the backspalash. It looks great. I also agree the appliances need to be updated. 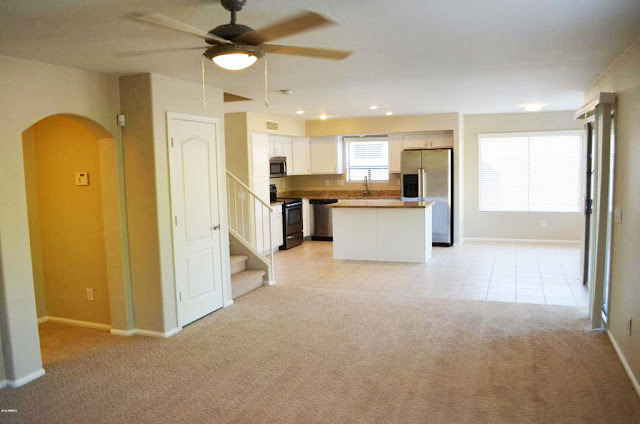 As to the wall color, is this an open concept? If so it will need to tie into the rest of the house to make the house flow from one room to the next. In my design class, a highly recommended color that works in most homes is Benjamin Moore Shaker Beige. Also, a beautiful window treatment and beautiful accessories will add so much to the space. I love the bay window area! With Kitchen 1, you are ahead of the game because you already have your appliances. It is hard to tell from a picture, but I wonder if you changed the wall color if your granite would not appear so pink to you. It doesn't look pink from the picture, but I am not there in person. Also, accessories and lighting can make a huge difference. I hope this helps, and I hope that you have a wonderful day! I would always pick size of kitchen over cosmetics. The first kitchen is easier to visualize but I think the lack of storage and counter space would eventually drive me crazy. I would paint the cabinets. 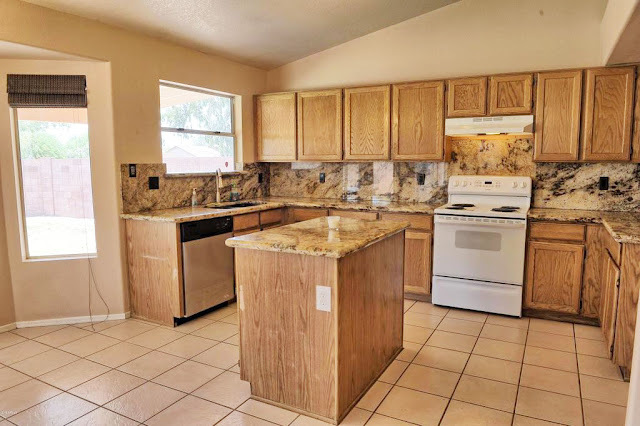 If you keep the granite on the counter I would pick a darker color for the cabinets and try to go with a neutral back splash like a tumbled stone. I would make a custom hood vent to draw the eye up. I would put open shelving on the left side of the window and trim out the window making it look more substantial. I would sink the microwave into the island somewhere so it didn't have to sit on the counter. You could just change the granite on the island to a black soapstone or honed granite in black to give some variation and a break from the pattern. All this plan is for kitchen 2. Which property makes you feel good overall? Go with that and worry about the kitchen later, is my suggestion. Looking at the floor plans I can tell you I'd go bonkers with the second appliance arrangement. Too far between sink'fridge'stove. I;ve never had an island in the middle of my kitchen, but think i would get sick of walking around that one between sink and fridge. Or maybe it's just that I can;t imagine how convenient it might be to you......I think i've seen on a blog an island made movable. (But be sure you can lock it down to keep it sliding away from you.) Maybe a trip to Lowe's for a consult with their designer would help you decide on colors and have suggestions for replacing the gross granite? I'd definitely get rid of that. Maybe tile over it? I came over to link up to your party but I was intrigued by your post. We are gutting the kitchen in our 16 year old home that we bought last year. So I will be following your progress, if you choose this house, closely. We are supposed to start in October so I am grabbing ideas everywhere. I am not opposed to granite as a back splash but I can see that this one is a bit limiting. I tried to zoom in and I'm wondering if a warm gray would work with this granite. It is trending now and because the cabinets take up a lot of visual real estate, you might notice the cabinets and the back splash would be the accent. This might sound crazy to you and would be a bolder move, but if it were mine I would consider painting all of the base cabinets either black or a dark brown/gray and painting the uppers a warm tan. If you are handy at all I would think about adding a couple of glass front doors to two of the upper cabinets to break up that line up. I think this room has possibilities. Can't wait to see where you take it. These are tough. Kitchens are the most expensive area in a home. I agree all that granite is way too much. Only problem with removing it from the backsplash is the wall will be mostly ruined behind it because they use some kind of adhesive to put it up there. That would be another repair to have to consider. As long as the home meets your needs and is located where you are comfortable with then eventually you can get into fixing up the kitchen. You could upgrade the appliances right away and then figure out the rest. Seems like that last one with all the granite would be better with a darker cabinet. Refacing them would be cost effective. The first one looks cute. That pantry on the end holds a lot so maybe it won't be as small as you think. Lots to consider that's for sure! I really like the third photo with black countertops. Seems like if you could turn the island around the other way and add cabinets over it, you would have storage, but that would mean a new floor. I have a small kitchen with few cabinets and always shuffling things. If it doesn't feel right, you will know. I don't want to drag anyone down, but I'd pass these and keep on looking. Several years ago my hubby and I bought a house that we lived in for 20 years. We loved everything about it and it was the most wonderful neighborhood to raise our son in. We looked at over 200 homes before we found it! Sounds crazy, but our realtor was a jewel and kept saying she didn't want us in anything we didn't love. I would have settled for several of the ones we saw, but hubby said, "No," and I was so glad I listened. I don't really care for #1, too small, too pink. Number 2 has real potential. I would refinish the oak cabinets with a darker stain. You have done it before so you know the work involved, but it would be beautiful. Remove the granite backsplash, replace with with maybe tumbled marble. Paint the room a soft creamy white and replace the appliances when you can afford to. It would be beautiful!! I think painting oak always ends up looking tacky, sorry. I use a program at Better Homes & Gardens title Design~A~Room. You can start with a clean slate by drawing out the dimensions of your room. Then add you own floor plan. I think #1 needs a complete re~arrange of work space. and increase your counter space. This would allow for a long island, as well! "Mr. Ed" has several graph paper notebooks, as he does the same thing with pencil & paper. Many times we look at what others have done, know it doesn't work and don't realize the full potential until we clear it all out and begin anew in the space. I agree #2 with all that granite would be another challenge! Don't get discouraged, dear friend! You'll know when the home is the right one for you! What a dilemma - yikes!! Just from the pictures, I think #2 "Ugly Granite" is the better of the two in terms of size and layout. But for me personally.... ALL the granite would need to go! I read through the ideas above and have to agree with two of them; make sure the house appeals to you overall, or just keep looking. On the other hand...I have also seen the kitchen that Dear Lillie did in her bother's house...it's amazing! I don't envy you, but I sure look forward to reading more!